Marvel has announced a new digital Marvel Infinite comic called Deadpool: Too Soon written by Joshua Corin with art by Todd Nauck, starting July 6, 2016. A preview can be seen below. New York, NY—June, 30th, 2016 — It’s the Deadpool team-up you’ve all been waiting for! 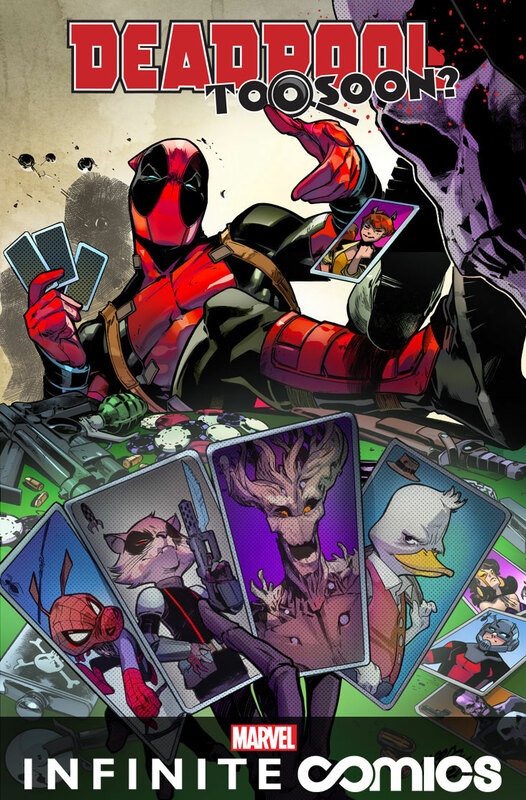 The Merc With a Mouth joins forces with the likes of Squirrel Girl, Rocket Raccoon, Groot, Ant-Man, Howard the Duck and the Punisher to solve a murder most foul in DEADPOOL: TOO SOON? #1– the newest Marvel Infinite Comic coming to digital devices everywhere on July 6th! Marvel newcomer Joshua Corin joins artist Todd Nauck for a tale mystery & mayhem in the mighty Marvel manner! Someone has murdered the Forbush Man! Could someone be targeting some of the Marvel Universe’s funniest heroes for death? That’s certainly what Deadpool thinks – and he’s gathered a number of characters in a spooky old mansion (naturally) to help crack the case. Good thing Deadpool is known for his world renowned investigative skills! But as more bodies start turning up, can these heroes solve the mystery before their goose is cooked? Specifically designed and optimized for digital devices, DEADPOOL: TOO SOON? joins the ranks of other Marvel Infinite Comics such as X-Men ’92, Deadpool & Cable: Split Second and many more. Utilizing the latest technologies to create dynamic new storytelling possibilities – Marvel Infinite Comics push the boundaries of what’s possible with digital comics. Never experienced a Marvel Infinite Comic? Now’s the perfect time to jump in! Don’t miss DEADPOOL: TOO SOON? #1 – on-sale next Wednesday, July 6th! !